My first ‘sign’ was a few days ago. A simple poem on Facebook. No wait, I’ll come back to that. My first sign has actually been screaming at me (figuratively, and sometimes literally…) to stop and smell the roses for 6 years. My gorgeous little girl who turned 6 years old this year. Sometimes I feel a little disconnected and distracted, as I look at all the things piled on my plate, and then I look to my children, upending my plate and creating chaos in a way only children can. It is a little bit blissful and a little bit frustrating all at the same time – I have ‘things to be done’ but at the same time, I have children. I play that internal tug-of-war where I think to myself “well, my lecturer/boss isn’t going to just wait to hand that assignment in/finisih that project while I play shop-keepers with my kids”, and then I think “but, my kids are as important and deserving of my time as anything else in my life”. Sometimes I act like the things I have to do for my kids – making food, bath time, getting to and from wherever we need to go, putting them to bed (etc., the list is endless but you get the idea), is just the transition between all the things I have to do. Sometimes (more often than I car to admit) I treat the things I do with them and for them – like playing shop-keeper – as a distraction from my ‘important stuff’. And I am distracted while I’m with my children, thinking about what I should be doing, or what I have to do next. My second ‘sign’ was a few days ago. The poem I saw, on Facebook. I have a moment to Just Be. not by chance, but choice. I got thinking, how often do I ‘just be’? ‘Just be’, in between the work, when I enjoy the moment before jumping in to the next thing. How often do I make the most of my transitions. How often do I mindfully participate in the ‘in between’? Not as often as I should. My asana practice has ‘lead ins’ – poses that have an obvious lead to the next – but what do I do in that time between moving out of one pose and into another? My mind usually shifts immediately from the previous pose to the next pose, without thinking about the important work my body is doing in between. But … that stuff in between is really important, and I am missing it by trying to rush from pose to pose. 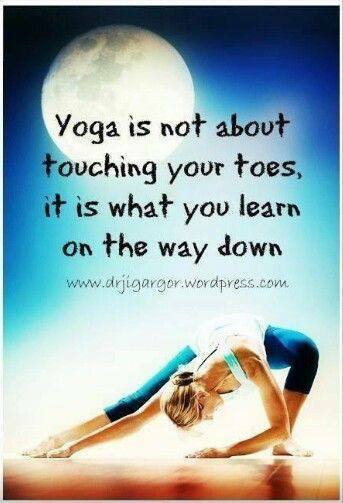 This is yoga, the pose, the breath, the mind … everything! So I stopped. And I just sat. In the moment. Alongside everything else. Taking notice and existing. And I didn’t look at anything with intent. I didn’t see the weeds with the intention of pulling them out. I just saw the weeds, as they are. And I didn’t look at the sky with the intention of deciding if it was a suitable washing day. I just saw the sky, as it is. I didn’t take the moment of stillness to go through my to-do list, I didn’t see it as time wasted that could be better spent ‘actually doing something’. I acknowledged that at that moment, ‘just be’-ing was actually doing something! And it was lovely. It moved into a meditation of where I am, and where we are, alongside everything else. Being, and doing, and working, and striving, and where we are at the end of it all. And then it reminded me a saying that I love. And that I now love even more, because I experienced the truth of it, rather than just hearing it and knowing it means something. Ok, so the quote is not technically about transitions. But it speaks volumes about the importance of the journey rather than always focusing on the destination, and then the next destination, and then the next one again, without slowing down and taking in the scenery and ‘Just Be’-ing. So my yoga, right now, is to just be. Just be in each moment, mindfully and patiently. Love it Alisia! I too have been caught up with in between mentality. I’ve fallen off the wagon and this post reminds me that I best get back on and start really smelling those roses!